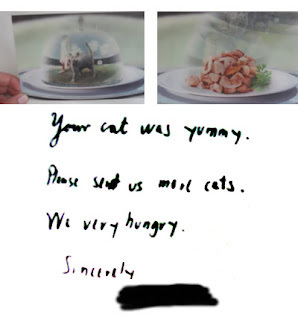 We received a vicious holographic postcard in the mail last week. Tomorrow we leave for Bavaria to take revenge. Ever since we bought the huge bag of spinach in our freezer, we've been trying to add it to our dinners. Our most successful attempts have been variations on the following recipe (which is South American, for the record). It's a flexible recipe and it takes new flavors and spices well. I will make it for you if you come visit. 1. Heat the oil in a large, heavy skillet over medium heat. Add the scallions and cook, stirring for 1 minute. Add the mushrooms and cook, stirring, until tender, about 5 minutes. Sir in the parsley, basil, salt, and pepper. Add the spinach, chicken, tomato paste, and cream and bring to a boil. Immediately reduce the heat to medium-low and simmer for a couple of minutes. Taste for salt and pepper. 2. Bring a large pot of salted water to boil. Add the spaghetti, stir, and cook to al dente. Drain thoroughly and transfer to serving bowl. Top with sauce, sprinkle with Parmesan and serve immediately with extra Parmesan on the side. From my favorite cookbook The South American Table. [short aside] One time, I met this woman on the El named Joyce. Between messy handfuls of chips and sips of Coke, she leaned over and said conspiratorially (and I believe without irony) "They call that sugary stuff breakfast?" I followed her gaze to a couple eating doughnuts out of a white paper bag. I shook my head neutrally. Our train camaraderie thus cemented, she decided to quiz me on the cost of her Aldi purchases. The last item was a big roll of paper towels. "How much?" she shouted, as we entered the noisy underground part of the red line. "Ninety nine cents," I suggested reasonably--too reasonably. She looked disappointed. "These are nice paper towels! Really thick." I think I revised my estimate, but still came in too low. If my memory serves me right, they were about $2.99, so I had a hard time looking impressed. If you're going generic, there's no hiding it. Like the Jolly Green Giant, they'll see you coming to the checkout with your budget foods from aisles away. But I have no shame, the quality of almost all of the Migros foods we've eaten so far as been great! Not to mention we can pretend we're part of the Dharma Initiative. Looks like another successful product placement for The Heidi Foundation. 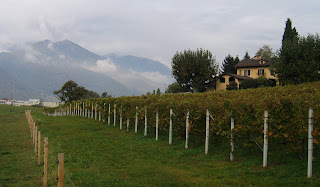 On a pleasantly dreary walk this morning, I discovered a vineyard near our house! 1. Despite careful examination of the washer in the laundry room of Centro Cristiano, we couldn’t figure out how to open the door. We tried all the usual techniques - pulling at the corners, pushing in on it to make it spring back, putting in some money... but nothing. Every moment we stood there haplessly poking at it, we felt lamer. Eventually, when we couldn't bear it any longer, we trudged away, defeated, with our dirty laundry (completely baffling the woman who had come down at that moment to do her laundry). 4. On our first visit to IKEA, we spent more than a few minutes venting about what a dumb, expensive country Switzerland was because the shopping cart cost 2 CHF to use. On the second visit we started counting up how much money we'd be spending on SHOPPING CARTS in two years. Then we saw someone return her cart and get her 2 CHF back. Sunday was election day for the Swiss parliament and it seems the country's heading right. The Lega dei Ticinesi did fairly well in our canton of Ticino and the UDC/SVP Swiss People’s Party was also successful (their sheep ad was recently deemed racist by the UN, but they maintain it’s just a figure of speech which refers to the “criminal foreigners” they want to deport). They received about 27% of the vote, enough to cause a bit of an upset in the usually balanced Parliament. Support for the Swiss People’s Party comes mostly from those who want less government control and nothing to do with the EU. So, although Swiss Mr. enjoys spending a good amount of time suggesting ways we can disrupt the social order while we are here, as foreigners, I believe we’ll have to be on our best behavior – especially after we “announce” our presence at our local government building, as we have been instructed to do. We’ve been putting that off, not really knowing what is involved. I think we get health insurance and they put our names on a local bulletin board for all to see (for civilian watchdog groups, no doubt). The churches already know we are here – bulletins in the mailbox makes it feel just like home! This weekend we took a visit to our mountain neighbor, Monte Brè. Along with some varilingual European tourists, we took a series of funciular rides up to the top. (Unlike our European counterparts, however, we only paid half-price, being residents. ha ha!) We decided to save the longer hikes for another time and instead took a short walk over to the little town of Bre. It was just what you might hope a little mountain town in southern Switzerland to be: rustic and italianate, quiet and charming. I did not see any catholic clergy there, but it seemed like the serene, serious sort of place they might like to hang out and be reflective. Hunger brought us to a nearby grotto, where, feeling a bit like hobbits, we ate some risotto with mushrooms, local meats, and beer. We've learned grottos are very characteristic of southern Switzerland -- imagine Moody's pub crossed with your grandmother's basement and add some taxidermy. The atmosphere is very informal and the food looks and tastes like home cooking. We weren't quite as ebullient as the other families packed in at the other tables, but we had a very nice time. Perhaps you have wondered whether we have a Swiss bank account yet. Affirmative. Unfortunately, we don’t have enough money to obtain an account which requires retinal scans or fingerprinting (or guarding by goblins). 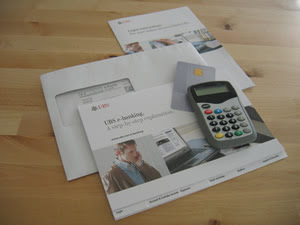 Instead, we have the “UBS Welcome” package, which gives us a year of fee-free use. 2. Enter PIN number (different from bank card PIN) on the keypad. 3. Go to web site and enter agreement number (different from account number) on the login page. 6. Enter the code into a field on the web site. I’m sure this will eventually be convenient. I am a a big fan of Rick Steves. We became good friends during that period last spring when we had three PBS stations and I could watch him every night. In general, I think he's a pretty smart tourist (even though he brings less underwear than he needs with the plan to wash it in the sink). I like the part about having a "fine nose at adapting the concept of fast food to travel." Huh? The Swiss Mr. and I – friendless, internetless, TVless, landlineless – have found ourselves recently with a good deal of additional time on our hands. The contrast with our former life in Chicago is a bit shocking when I think about it (or when I dream about it, as I’ve been wont to do lately). We’ve come up with some creative methods of coping – one of them being dessert. The dairy section in our local Migros grocery store is huge, even when you exclude the cheese. This, as you will no doubt realize, pleases me to no end. And close investigation of this section has revealed a trove of creamy dessert duos, by which we can entertain (and educate, of course) ourselves. Our first foray – the Bonne Maman crème brulee – was not even very successful, but still turned out to be very tasty. The participation required on our part to prepare the crispy caramelized topping was just what we were looking for to break up those long hours after dinner before one can go to bed in good conscience. When I lived in Spain, I lived with a wonderful family who graciously served me hundreds of meals during my stay. It is their custom to eat a late, light dinner, which we generally followed with some nice long conversation. During this time, my host mother Loli would often bring out some fruit and cheese (often “queso fresco”). After she found out how much I liked the particular cheese, she would bring it out after every meal and force me to eat some (she took a lot of pride in the weight I gained during my stay in her house). Of course, I could never resist, because I loved it. Loved it. Since then, I have examined the cheese selection in every country that I’ve visited, hoping to find something remotely similar. The closest I came was the “queso fresco” in Mexico, but it was not nearly young or soft enough. 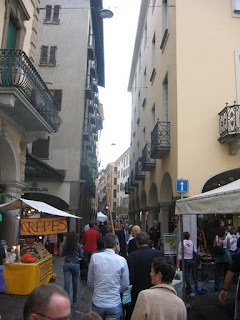 I was elated to find some “formaggio fresco” here in Lugano recently and just today brought it out to for lunch. This cheese was spreadable, slightly gritty, and also tasted like horseradish (in my excitement to purchase the cheese, I missed the “al rafano” in smaller lettering below “fomaggio fresco”). Yummy, but disappointing. So, I will continue my pleasant quest to find a cheese similar to the queso fresco I grew fat on in Spain. Whenever I asked for more details about the cheese, Loli would simply say it was fresh cheese from cow’s milk, baffled by my confusion. It is similar to fresh mozzarella (of which there’s plenty here) but somehow lighter, milder. It’s a cheese you could eat with anything, ad infinitum. It’s a cheese that, among other things, will bring me back to Spain someday. Having procured permanent accommodations just northwest of Lugano centro and the lake (15-20 minutes walking), it now seems possible to contemplate things slightly less mundane than cell phone plans or which color wood to choose during our IKEA binge (we went with “betulla“ throughout). 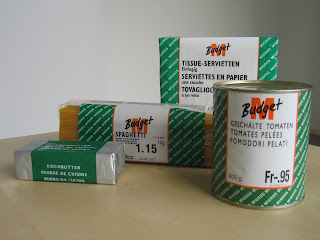 Some of my current puzzlements include: How can a pack of post-it notes cost the equivalent of USD 10? What are the people doing in their homes all weekend closed up behind their blinds? How can the cheese section of one small store be so huge (associated: in what manner do the luganese eat all these cheeses?)? 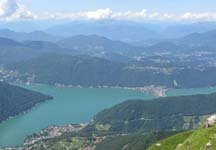 Where does Lugano fall on the political spectrum of the country? Why doesn’t anyone bike? I suppose I will have more questions than answers for quite a long time, especially not knowing much of the language just yet. (The student in me wants to learn the language thoroughly, systematically, the way they’d teach it in school, but I’ve had to hold off on that to memorize some practical phrases and words first, since we do actually have to function here. I’ve never had to spend time somewhere not already knowing or possessing a basic knowledge of the language to help orient me in most settings – it’s pretty humbling.) Although I’m dying to come to some quick conclusions based on a few observations, I’m determined to hold back, having recently identified this stereotyper tendency within myself as generally inaccurate and limiting. So for now, I’m doing my best to enjoy the developing plot. After seeing an ad on the bus, Swiss Mr. and I decided to attend the Lugano autumn festival down in Lugano centro last weekend. Although one of our guidebooks told us “little girls throw flowers from blossom-covered floats and oxen pull festooned wagons in colorful procession,” we missed seeing any floats, flowers, or even any noticeable quantity of little girls. Wrong festival? Or maybe we did not get up early enough for that. We did see many little booths selling meats, cheeses, honey, homemade knit items, belts, jewelry, antiques, etc. There were also many families and couples strolling about, which gave us a good opportunity for covert people/attire watching. 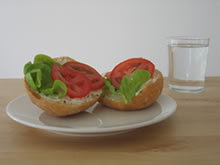 I ate a doughnut with a disappointing allotment of Bavarian cream, while Swiss Mr. partook of a much more satisfying encased meat on a roll with onions and tomatoes. Can you spot the alpenhorn?